My farrier looked at Derby on Friday, and assured me that he wasn’t re-abscessing in his left hind. He had some minor remaining bruising but said that he was fine to ride. So, after a few days off due to my dithering and uncertainty, we tacked up and had an easy ride. Saturday I asked him for a bit more, getting a little resistance that I was able to overcome. And today, we did even more, and Derby was lovely. 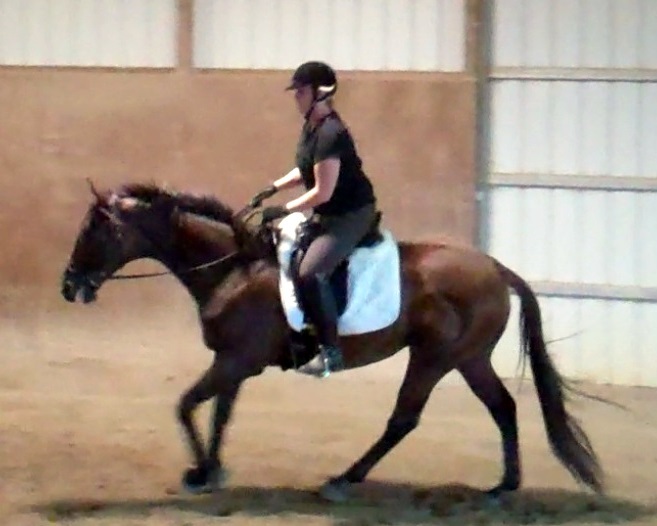 I’m starting each ride with good walk work, concentrating on getting Derby into the bridle. 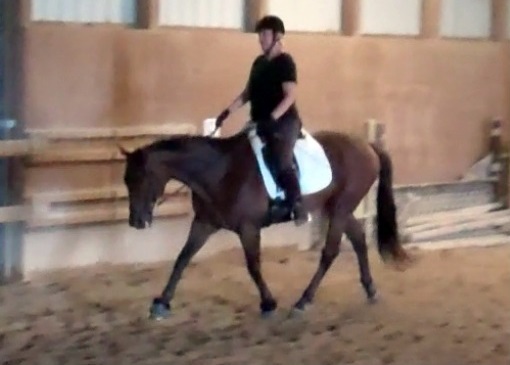 However, I’ve decided that the warm up routine that works best for him is this: forward walk (no real lateral work) followed by a lap or two of trotting on a loopy rein to during which he sneezes and clears his pipes, then on to good solid forward trot – and then the work can begin. 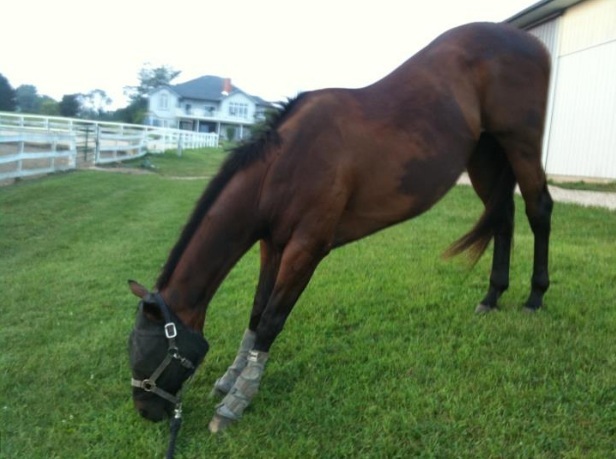 Lateral work at the walk is best done during walk breaks – which really aren’t “breaks” at all. What was so nice about today is that I was really able to get Derby into the bridle, and once he was there, he felt so solid and responsive. I was able to regulate his stride easily, and I didn’t have the issues bending him when I had that good connection that I do when the contact is tenuous. He was also very forward, moving out very well and really covering the ground. It felt simply marvelous. We did shoulder-in both ways, and some decent leg yields too. I was especially pleased because I hadn’t been feeling great prior to the ride – but needless to say my mood was elevated and I felt pretty good when I dismounted. I wish I’d had a reservoir of energy today, because I just didn’t have it in me to ride Oliver, with whom I’ve been entrusted this weekend while Steph is away. 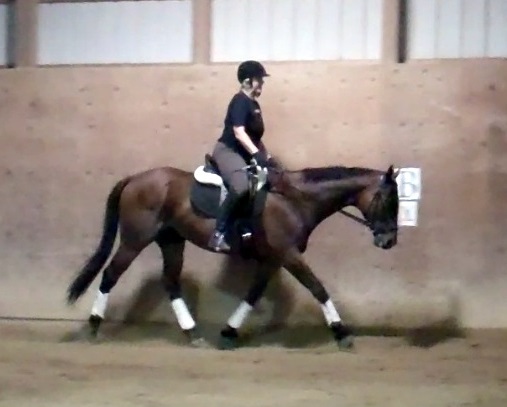 For fun, I took a lesson on him yesterday, and got a real workout in riding the horse forward into contact. With Oliver, I’m trying to give him a longer rein, and then invite him to move forward into that contact, filling up the slack. This is tough, because he doesn’t move forward readily, and he likes to go around with his head up. Really up! 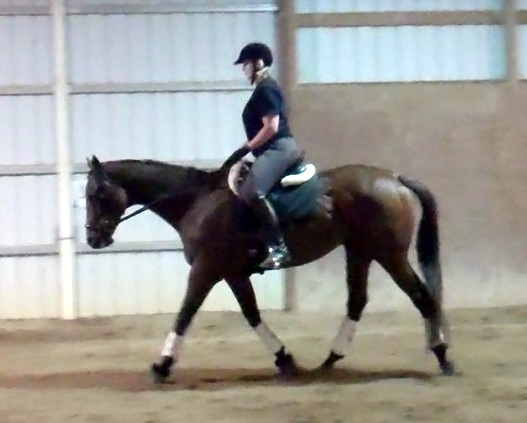 I was hoping to do some canter work with him, but my agenda quickly refocused – first and foremost I wanted to get him to relax, and reach for the contact. 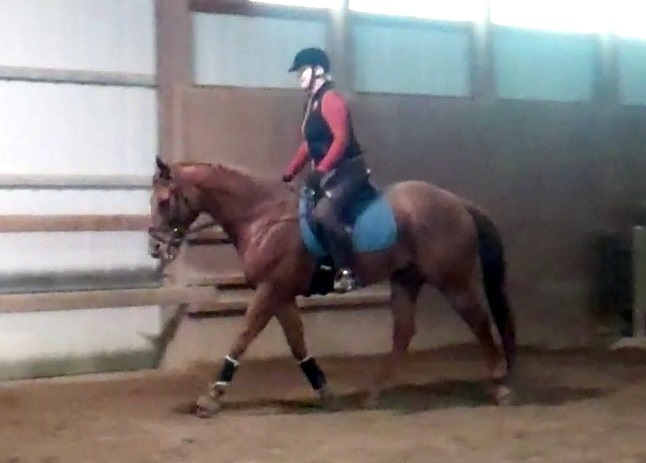 As you can see from the video clip below, we got there, but I literally had to manage almost every stride, putting leg on, on more, softening immediately to reward the correct behavior, and continually sending him forward and inviting him to fill up the the reins. I want him to be the one pulling on the reins, not me. It was fun to ride Oliver again – he’s got better gaits than Derby and someday is going to be a very fancy fellow indeed. 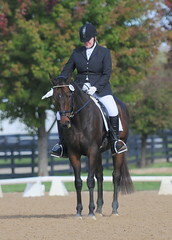 I’m going to bed early tonight, and hope to get another ride on him in tomorrow night, before my lesson on Derb. My ride on Oliver yesterday gave me some ideas, and my ride on Derby today reinforced the feelings of gait quality and contact. I’d love to be able to replicate that feel on Oliver.